Security is one of the most important components of any network and one of the most overlooked. If you have a corporate network with any sensitive information on it, it could be vulnerable to being compromised. Security needs to be strong on the outside to stop hackers, worms and viruses. Internal security is often overlooked, and can be just as important to stop file sharing programs, chat services, and inappropriate web browsing. Vision Networking will provide a hardware and software security audit of your network. We can make suggestions to correct any problems by patching your existing system or implement new security tools to lock your network down. The question to ask yourself is if a person or virus were to break into your network, would you know about it before the damage is done? The security solutions we provide not only protect you but also inform you. Vision Networking can provide antivirus software which provides well balanced, state-of-the-art protection against threats endangering your PC and enterprise systems. Viruses, worms, spyware, trojans and other malware are kept away from your valuable data. Advanced detection methods implemented in the software even provide protection against the future threats from most of the new worms and viruses. If you are already infected, we use many advanced tools to clean your computer and have you back up in no time. If you are concerned about your network's security, Vision Networking will provide a free consultation and recommendations, based on your needs. Virus software alone will not protect your network. Many viruses can even disable your virus software or cripple it so it looks like it is working. A firewall adds a steel shell around your network that will make it more secure and reliable. You will be protected from automated viruses scanning the internet and hackers out to obtain your data. We only sell hardware firewalls not software firewalls. The firewalls we have available are on dedicated hardware between the internet and your internal network. 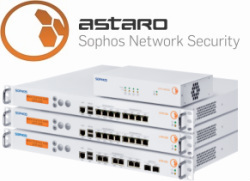 Vision Networking uses and recommends Astaro Sophos firewalls.